The Smoant Charon Mini is the spiritual successor of one of last year’s most popular vape mods, the original Smoant Charon. 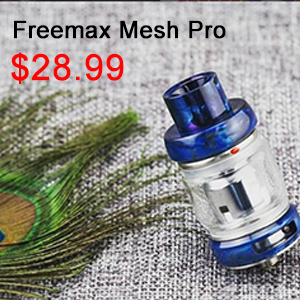 However, apart from the name and the fact that they are both dual 18650 mods, these two devices don’t have very much in common. 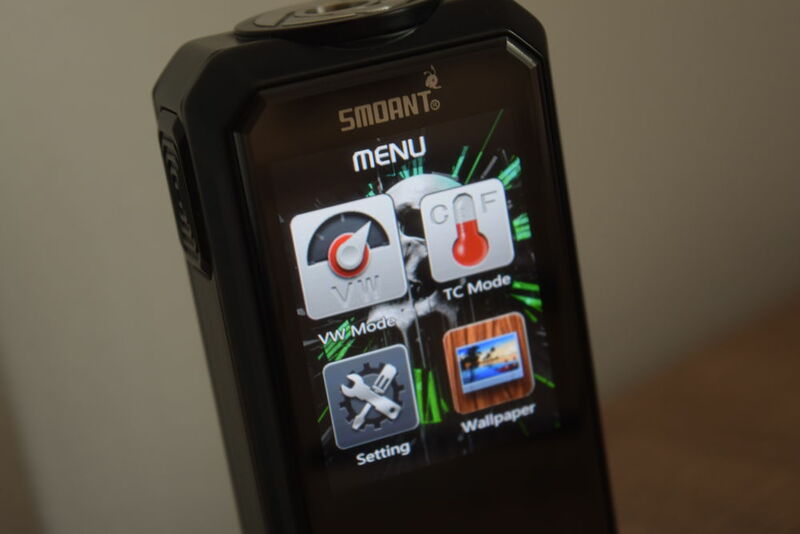 The Charon Mini has a completely different design, as well as a new settings menu and a much larger TFT display. To be honest, it looks so much more modern that it’s hard to believe that the original Charon only came out around this time last year. It just shows you how fast the industry is moving, I guess. 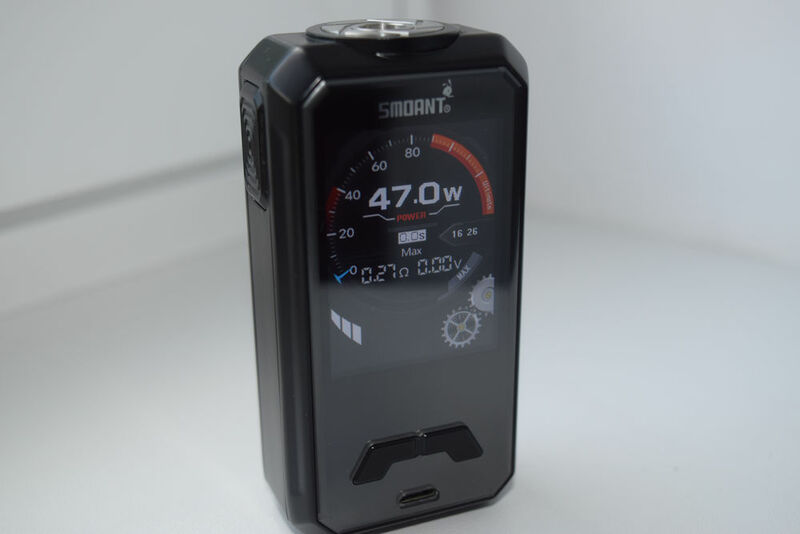 The Smoant Charon Mini comes in a rectangular cardboard box with a picture of the mod and its impressive display layout on the front, and a list of contents as well as company information on the back. Inside the box, we have the Charon Mini sitting in a Styrofoam holder, and underneath that is another compartment containing a micro-USB cable for charging and firmware upgrading, a user manual, a battery safety card and a warranty card. 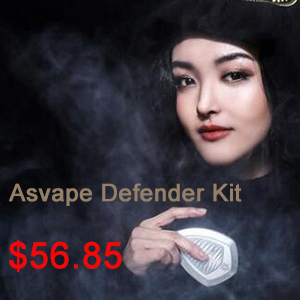 It’s pretty much your average vape mod kit, nothing out of the ordinary about it whatsoever. I still love my original Smoant Charon. I don’t use it as much as I used to, but I still think it’s a great mod, especially in terms of performance. That said, I was never crazy about its design. It was sturdy and ergonomic enough, but it just didn’t stand out at all. It had one of those small, rectangular displays that are considered outdated nowadays and a metallic, sleeve-like battery door, but no eye-catching elements at all. The Smoant Charon TS 218, on the other hand, was a much more impressive device. It had a large, bright touchscreen that was actually very responsive, and it was a more refined device, overall. The new Charon Mini borrows the best features of the two previous mods in the Smoant Charon family. 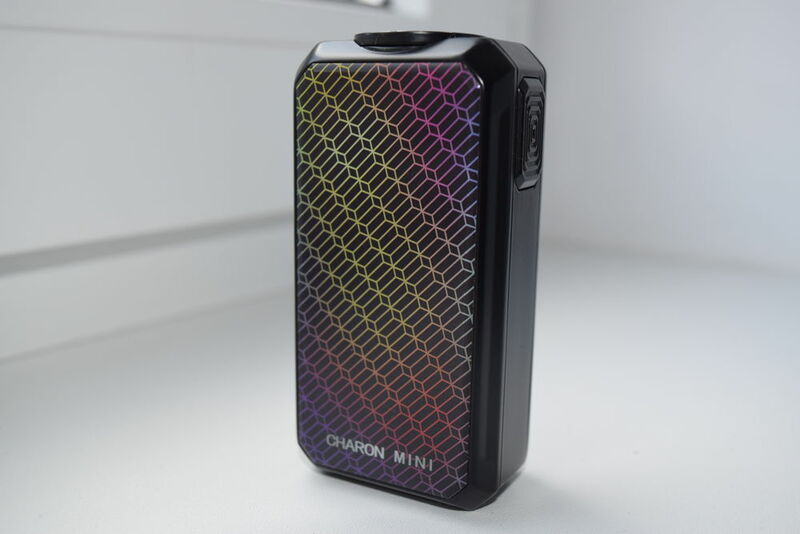 The Charon Mini is a compact dual-battery box mod that measures 89mm x 45mm x 29mm and comes in four different colors – black, red, gold and rainbow. 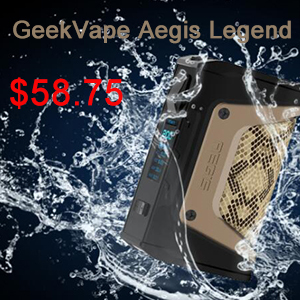 As you can see from the size specs., it is a bit more girth than most other compact dual-battery box mods, but I can tell you that thanks to its rounded edges and corners it is really comfortable in the hand. The first thing I noticed about the Charon after taking it out of its box was the centered 510 connection. This is a huge improvement over both previous Charon mods, which had the connection located to the side. The connection plate is slightly raised and has a diameter of 25 mm. However, the fact that it’s centered means you can easily use atomizers up to 26 or even 28 mm in diameter without overhang being a huge issues. Personally, I wish all manufacturers would adopt the cenetered connection standard. The next thing you’re bound to notice about the Charon Mini is the glass-like front panel. It gives the impression of a huge display, and even though only half of it is taken up by the actual screen, with the lower half being taken up by the two adjustment buttons and the micro-USB port, this still leaves you with a 2-inch color display. 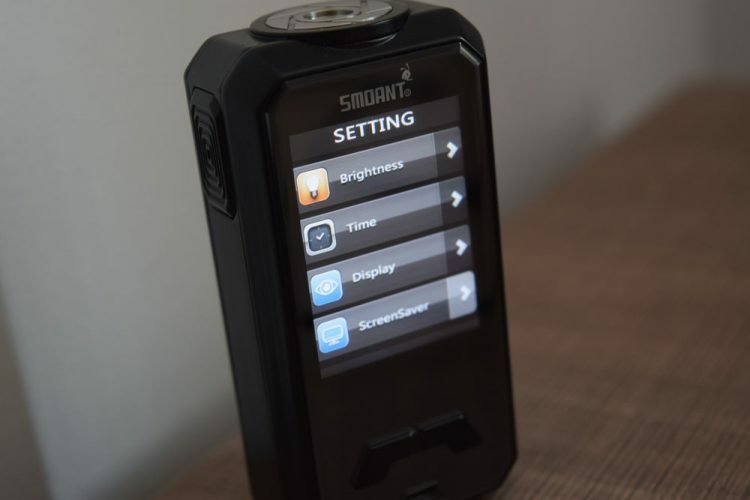 There is no question that the gorgeous TFT screen is the main draw of the Smoant Charon Mini. 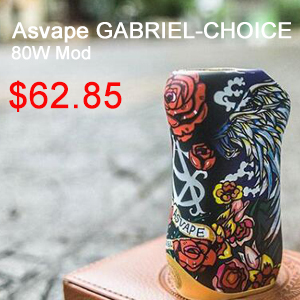 With a 300 dpi resolution and 262,000 pixels, this is by far the best display I’ve ever seen on a vape mod. It has the exact same layout as the Smoant Cylon and the Smoant Ranker, but the size of the display and the clarity are on a whole other level. On the other side of the mod, we have a magnetic battery door with a 3D-like multi-color design pattern on it. To remove the door, you have to stick your finger nail in a small slot on the bottom of the device, and pull. Unfortunately, this is not the best battery door I’ve ever seen, not even close. Although it has never come off accidentally, it does wiggle in my hand quite a bit, and that feel really awkward. I don’t know why the three pairs of magnets allow the door to move the way it does, but I do hope Smoant picked up this design flaw before the device’s official release. I received an early sample, so I don’t know if the final version has the same problem. The fire button is located on one of the narrower sides of the mod, near the top. It’s a large, rectangular button that you can just as easily press with your thumb or the index finger. The button is nice and clicky, doesn’t rattle at all even when you shake the mod, and even though it’s made of plastic, it doesn’t feel cheap. 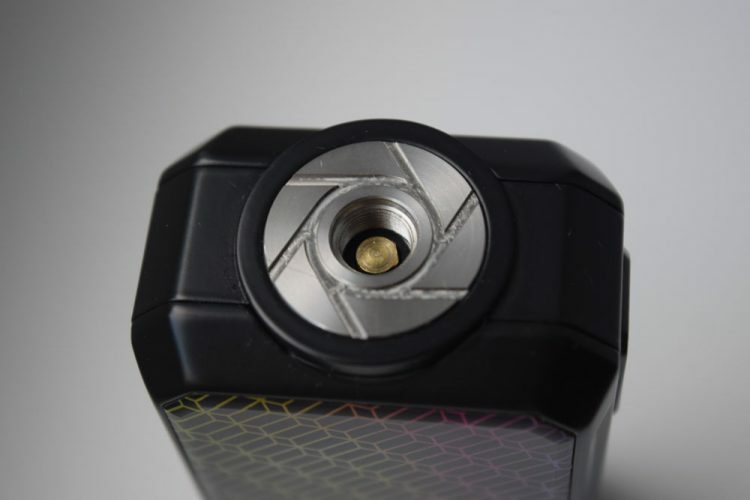 Finally, on the bottom, the Smoant Charon Mini has an impressive number of battery venting holes, so even though battery malfunction is extremely unlikely – if you follow the principles of battery safety – you won’t have to worry about gas build-up in the mod. Overall, the Smoant Charon Mini feels like a durable and comfortable compact mod, with the exception of that wobbly battery door. 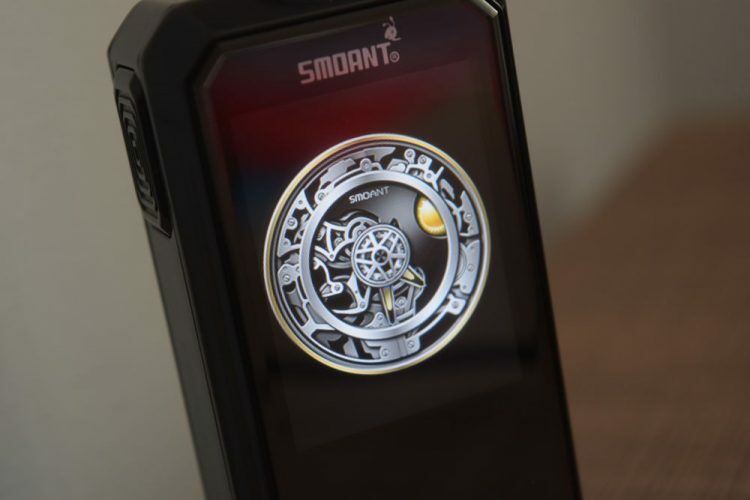 The new Smoant Charon Mini is powered by the company’s proprietary Ant225 chip, which appears to be very similar to the Ant 218 chip used in the Cylon and Ranker mods. These mods all have the same display layouts and settings menu, so it’s fair to assume that the differences between the two chips are minimal. If you’re familiar with either the Cylon or Ranker mods, using the Smoant Charon and navigating through its menu will be very easy. 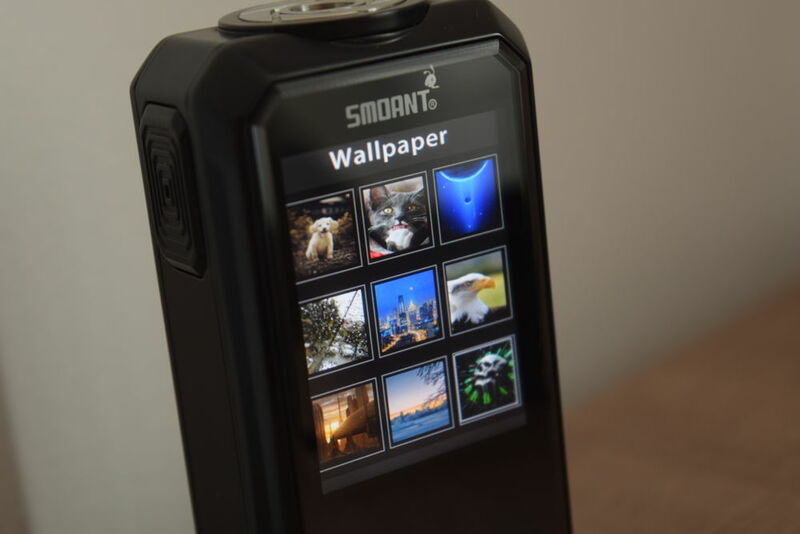 Al these latest devices from Smoant have essentially the same menu and navigation, so I’m not going to go through all the different options again here. If you’re interested in a more detailed presentation of the Charon Mini menu, check out my review of the Smoant Cylon, it’s essentially the same thing. To get into the menu, all you have to do is press the fire button three times in rapid succession. You will be presented with four main submenus – VW Mode (wattage mode), TC Mode (temperature control), Settings, and Wallpaper. In VW Mode, you can choose between three preheat options (Min., Normal and Max.) as well as a Custom Curves mode, where you can set the power for the first 10 seconds of your vape, in 1-second increments. In TC Mode, you can choose on of the three supported materials (nickel, titanium and stainless steel), TCR and a TC Custom Curves Mode. In Settings, you can adjust the brightness of the display, set the time, choose one of two available home screen layouts, choose if you would like the default mechanical clock or one of the nine available wallpapers to be displayed as the screensaver, set the timeout for the display, and an option to return the mod to factory settings. Finally, in Wallpaper, you can select one of nine available wallpapers. However, you can also upload a custom wallpaper if you’d like to personalize your device even more. That’s pretty much all there is to the Charon Mini menu. You have to use the two adjustment buttons under the display to cycle through the different options and press the fire button to confirm your choice. There’s no selection or back button on this device, so to exit the menu or a submenu, you have to keep the fire button pressed for a couple of seconds. I’d like to touch a bit on the UI here, because it’s my favorite feature of this mod. 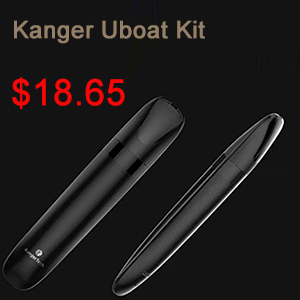 You have the same two UI options as on the Smoant Cylon and Ranker, but the default one is definitely the best. It’s styled like a car’s Rev. gauge, with the needle going up when you press the fire button. 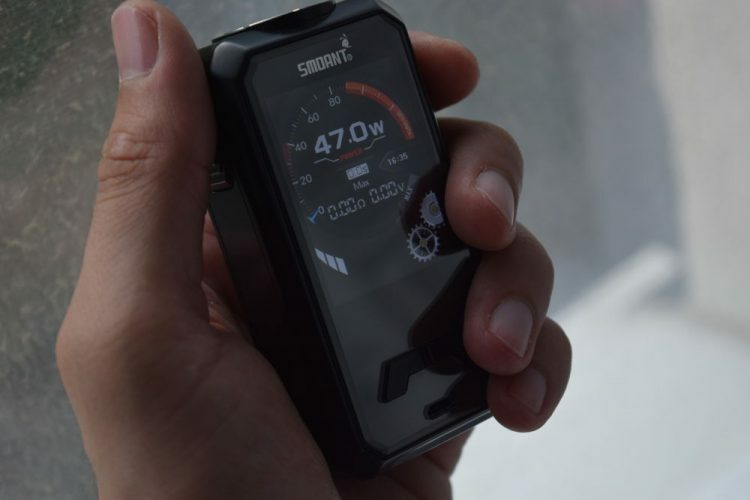 It looks just like the one on the aforementioned Smoant mods, only here it’s much larger, brighter and even has some moving elements – two gears in the lower right corner of the screen that keep rotating while the display is on. They serve no purpose other than to look good, but they do add to the overall charm of the mod. The mechanical clock that serves as a screensaver is also worth mentioning. It’s a much cooler version of the classic clock available on the Cylon and Ranker mods, featuring moving gears as well as changing sun and moon symbols, depending on the time of day. The Smoant Charon Mini is powered by two 18650 batteries. I wish it were compatible with larger capacity batteries, like 20700, but I guess some companies still prefer to rely on 18650s exclusively because of their reduced size. 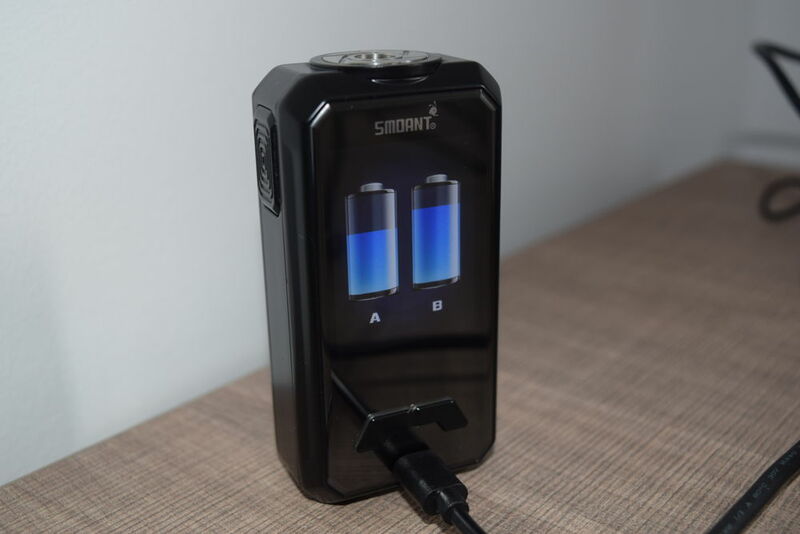 Like Smoant’s other recently launched mods, the Charon Mini features fast charging at a rate of 2A, as well as vape-while charging, so you can hook it up to your laptop or other power source and keep vaping on it while it’s charging. 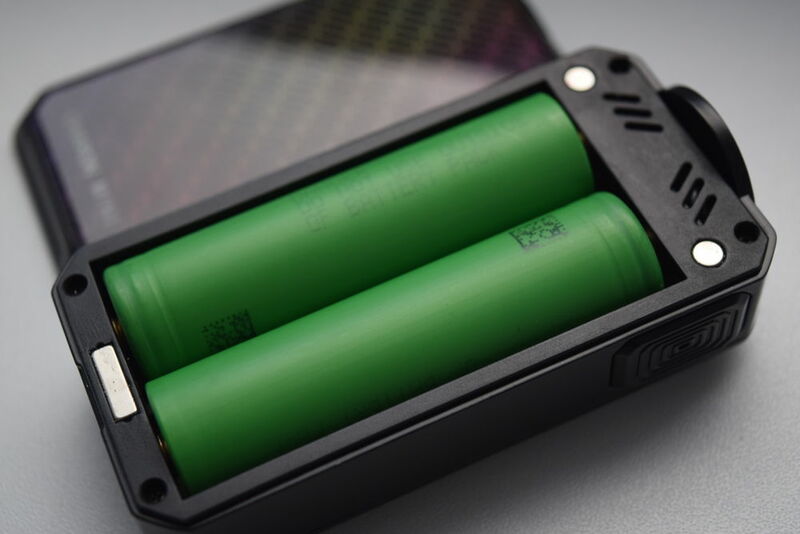 In terms of battery life, Smoant is notorious for being extra conservative when it comes to how low they allow the battery voltage to drop before displaying the “low battery” message and cutting off power, so you may not get as much out of the same two batteries, at the same power output, as you would from another dual-18650 vape mod. 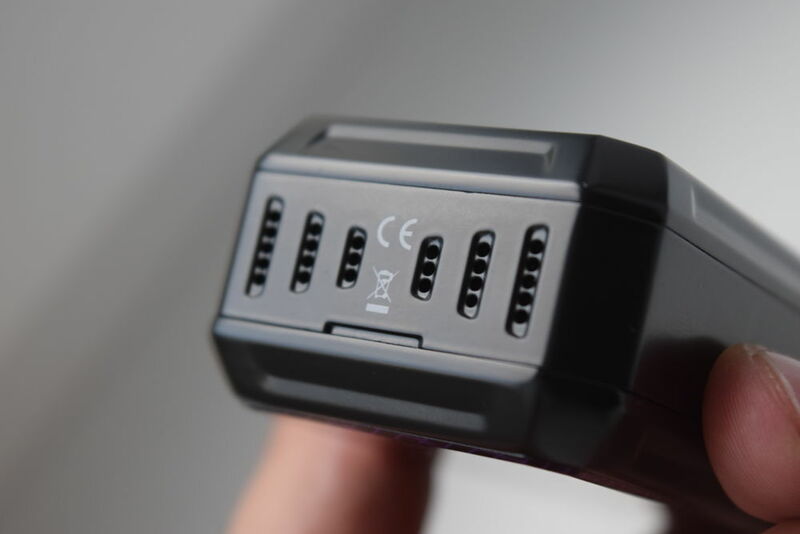 I personally don’t see that as a con, as the difference in battery life compared with other mode is negligible, and this is ultimately as safety precaution. A small con worth mentioning is that the Rev. gauge UI of the mod doesn’t display the levels of the two batteries separately, but as a series of horizontal lines for both batteries. So if one is full and the other is almost depleted, there’s no way to tell. Performance-wise, the Smoant Charon Mini is just as good as the Smoant Cylon, and if you read my review of that mod you’ll know just how crazy I am about it. This device fires just as fast. As soon as you press the fire button, you can hear the coil in your atomizer sizzling, and Smoant claims that it fires in just 0.015 seconds. The power ramp-up is also very impressive, especially if you set the preheat to Max. I’ve been messing around with the Custom Curves mode, creating custom power graphs for all of my attys, but at the end of the day, I always come back to straight wattage mode, for some reason. Having lots of options is definitely really nice, but somehow I always find myself using good old power mode the most. The Smoant Charon Mini has a slightly bumped up power level, compared to the Cylon and Ranker mods. Those two have a max output of 218W, whereas this one is capped at 225W. 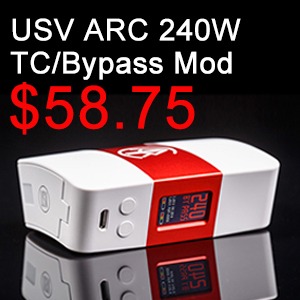 Does it really do 225W? I honestly couldn’t tell you, as I don’t ever vape at that power level, and I also don’t have the equipment or technical knowledge to test it, but even if it does, that 7W power difference is irrelevant. I can’t really tell you very much about TC mode since I’ve only tested it with a stainless steel dual-coil build. It seems to do a good job of protecting the wicking when it reaches the set temperature, and has never jumped out of temp.control, but I hardly ever use temperature control mode so I don’t have that much experience with it. The Smoant Charon Mini 225W box mod is a fine addition to the Charon family of mods. It looks great and feels comfortable in the hand, the display is hands down the best I’ve seen on a vape mod and it has the same great performance as the Smoant Cylon, which is saying something. On the other hand, I do hope that the wobbly battery door is just an issue with my early review copy and with the commercial version of the device, because it’s pretty annoying. If you already own the Smoant Cylon or the Ranker, I don’t really see the point of getting this device, because they are essentially the same in terms of performance and features. The only real difference is the size and clarity of the display. But if you’re in the market for a compact and cool-looking dual-battery mod with a massive screen and cool interface, definitely check out the Smoant Charon Mini.